IT LOOKED LIKE it had run its course, but one of the summer’s most surprising transfer stories looks like being back on. 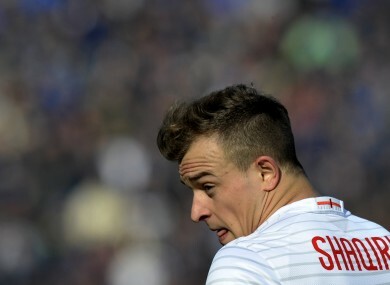 Stoke City boss Mark Hughes revealed Sunday that he is attempting to complete the permanent signing of Inter Milan’s Swiss international playmaker Xherdan Shaqiri. The 23-year-old former Basel and Bayern Munich star watched from the stands at the Britannia Stadium as Stoke lost their Premier League opener 1-0 to Liverpool. After the deal looked to have fallen apart earlier in the summer, Stoke manager Mark Hughes says that he’s remaining cautious, as they look to wrap up the Swiss star’s signing. “We are hopeful, but we have had a pre-season of chasing really quality targets,” said Hughes. Email “One of the summer's most unlikely transfers looks to be back on”. Feedback on “One of the summer's most unlikely transfers looks to be back on”.